What captures your attention at first can reveal a lot about your mind and personality. 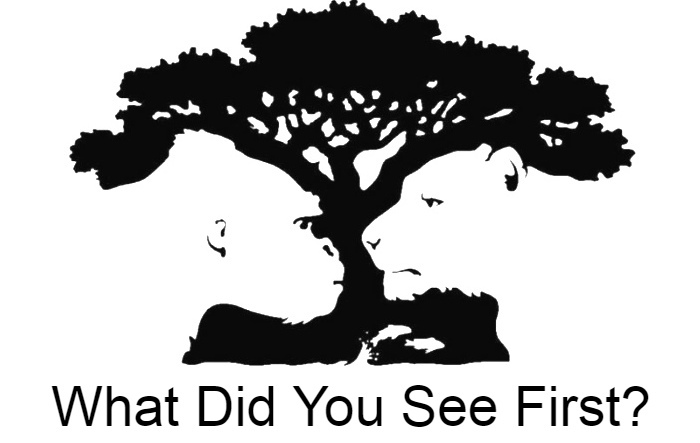 So have a look at the following image and check what you saw first with the explanations given below. The tree makes up the heart of the image and many people would definitely see it first. If it is so, then it means that you follow a logical approach to life where you trust your mind over your heart. You are looking for a sensible meaning of/in life. Such an approach can work in the real world when it comes to career but it also keeps you away from emotions and matters of the heart. It can also prove to be limiting, since you strive for what you believe is achievable, not for what you truly want. You need to take risks in life and hit higher than your normally mediated goal. Expand your horizons and see what happens, because a little spontaneity in life is necessary to make us humans or else we will be robots guided by algorithms. You can lead others but who will lead you? Step out of your comfort zones and push your limits to try something new and different. This means that you have self-esteem issues. You keep on berating yourself for tiniest of reasons. You put a lot of unnecessary pressure on yourself and when you can’t achieve your goal you blame yourself for it. However, you do have zeal to learn and advance in life but you should not be so hard on yourself. You also tend to explore ideas which people usually won’t, which is a good thing. But you should be careful of becoming too narcissistic because of this. You should stop being rigid about your opinions. A problem might have multiple answers so that doesn’t mean that yours is the only correct approach. Be flexible in hearing out others and stop being so hard on yourself. Interaction with others builds mind and makes you look at things in ways you never thought existed. So learn from life and keep moving ahead! This means that you are a wild, untamable soul. You act on impulse based on your instincts rather than any rational deductive approach. This kind of life is fun and exciting but it can also hurt people at times. You should be careful of your behavior despite your tendency to be free and wild. Your will to succeed makes you go all the way. You do not abandon the journey even if it becomes impossible for you to continue. So your wildness is both a blessing and a blockage. You do not like to follow the crowd. You make your own way even if it leads you to mistakes and dead-ends. Your spirit is unbelievably charged and can take on any problem head on. Your energy can prove to be infectious for those around you. You are a good person deep down but sometimes take care of how you behave with people close to you. Your habit of doing everything by yourself and not accepting help can be quite annoying. Let off some steam now and then. Let others help you for a change. The fish is hidden in plain sight which indicates to you having a hidden personality. You might blend into the picture but that doesn’t mean that you are not living your life. You love nature and life and also people who are close to you. You are loving and affectionate person who treats everyone with respect and understanding.